This question is relative, and the ranking is a bit misleading. QBR takes into account an entire season, and Mayfield had two distinct experiences for the Browns -- first with Todd Haley as offensive coordinator and then with Freddie Kitchens in that role. Under Haley in Weeks 1-8, Mayfield had a QBR of 35.8, which ranked 31st of 33 qualifiers. From Week 9 on, though, Mayfield's QBR was 70.1, which ranked seventh. For Mayfield, the biggest issue didn't seem to be his play or ability, but the approach and plays called. 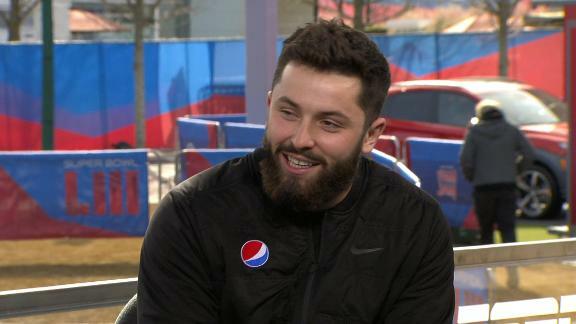 Placed in a system that eliminated seven-step drops and long routes and gave him the chance to get rid of the ball quickly and play fast, Mayfield responded like the first overall pick in the draft is expected to respond. Grow. Pure and simple. Continue to build off what he did with Kitchens, who is now the Browns' head coach, and to grow as a player and person. It's what's expected of any dedicated player going into his second season. Mayfield also can improve on some of the factors that went into his final QBR. First were his turnovers. He threw 14 interceptions and lost three fumbles; those 17 turnovers were tied for the third most in the league, according to ESPN Stats & Information research. In addition, his completion percentage (for the season) was 24th (63.8 percent), and he was not in the top 10 in some of the positive ratings categories (touchdowns per attempt, yards per attempt and others), per ESPN Stats & Info. QBR also takes into account how well a quarterback performs at key points in games; it might be interesting to know what Mayfield's QBR would have been had he completed that final drive against Baltimore. Allen's 56.2 percent completion rate at Wyoming was scrutinized during the pre-draft process but foretold his 52.8 rate as a rookie in the NFL, raising questions about his accuracy. Among quarterbacks with as many pass attempts (320) as Allen in a season, it was the worst completion rate in the NFL since Blaine Gabbert's 50.9 percent in 2011. The Bills defended Allen's college stat by pointing to his lack of a supporting cast and the difficulty of his throws. Both arguments could apply to his first professional season. An undrafted rookie, Robert Foster, led the team with 436 receiving yards on passes thrown by Allen, while 4.1 percent of Allen's passes (10th-most in the NFL) were dropped by his receivers. Only three quarterbacks over the past 10 seasons -- Tim Tebow in 2011, Drew Stanton in 2014 and Jameis Winston in 2018 -- averaged more air yards per pass than Allen (10.54) in his first season. Some of the accuracy issues still can be pinned on Allen; a league-high 23.7 percent of his attempts (excluding throwaways and spikes) were off target, according to ESPN Stats & Information. Allen had a knack as a rookie for making hard throws look easy and easy throws look hard. He completed a league-low 64.6 percent of his throws that traveled five air yards or less and was off target on a league-high 14.2 percent of those passes, per ESPN Stats & Information. The relative inability for Allen to execute a short, rhythmic passing game put stress on the offense, as did Allen holding the ball longer than any other qualifying NFL quarterback. He averaged 3.22 seconds before his passes, which was second only to Tebow's 3.35-second average in 2011 in the past 10 seasons. Allen too often looked for the home run as a passer and will need to take coaching that makes him more comfortable and capable of hitting singles and doubles. Expected improvements to the offensive line and skill positions could help, but Allen will need to take steps forward himself. Manning simply didn't make enough plays. He accounted for 22 touchdowns and 15 turnovers. Only two quarterbacks (Case Keenum and Derek Carr) started 16 games and threw for fewer touchdowns. With Manning, everything needs to be perfect for success at this point of his career. The combination of his offensive line struggling in the first half of the season with his immobility was crippling. Manning was sacked 31 times in the first eight games and threw one touchdown pass under pressure during a 1-7 start. He produced a first down on 13 percent of his dropbacks under pressure in the first half of the season. The NFL average during that span was 19 percent. If Manning returns for another season -- the Giants haven't publicly committed to that yet -- the hope is he can build off the second half of 2018, when he was a passenger rather than the conductor. New York relied more heavily on Saquon Barkley and the running game and asked Manning to do less. It slowed down the pressure and resulted in Manning throwing 13 of his 21 TD passes. He had a passer rating of 87.8 over the final eight games compared with 53.1 in the first eight games. Manning's physical skills aren't going to improve at 38 years old, but his efficiency can if the Giants ask him to do less. Choose one: a leaky offensive line that saw Carr sacked a career-high 51 times (he took 36 sacks combined in 2016 and 2017); no speedy playmakers at receiver (the inconsistent Amari Cooper was traded Oct. 22); a steep learning curve in Jon Gruden's back-to-the-future offense (dink, dunk, bomb?). 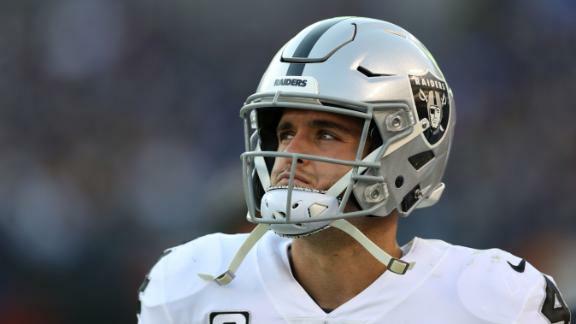 It truly was a baptism by fire for Carr, who entered the season with many people simply wondering how he would react to Gruden's oft fire-and-brimstone coaching approach. Having a pair of rookie tackles in first-rounder Kolton Miller protecting his blind side and third-rounder Brandon Parker also had to test the confidence of Carr, who has suffered a broken right (passing) finger, a fractured right fibula and three broken bones in his back since Dec. 24, 2016. He admitted to "taking inventory" after big hits, although the quarterback did improve in the second half of the season. A more buttoned-up O-line, a speedy No. 1 receiver and a threat at running back to open up the play-action game would do wonders. Though perhaps simply a second season with Gruden will produce a bounty. Consider: The only other time Carr played in the same system for a second consecutive year, in 2016, he played at a league MVP level. Then there's this -- after throwing seven touchdowns and eight interceptions in the Raiders' first six games, Carr had 12 TDs and two INTs after the bye, the TD-INT ratio of 6.0 the fourth best in the NFL in Weeks 8-17. He also had a streak of 332 passes without a pick, the third-longest streak in NFL history. 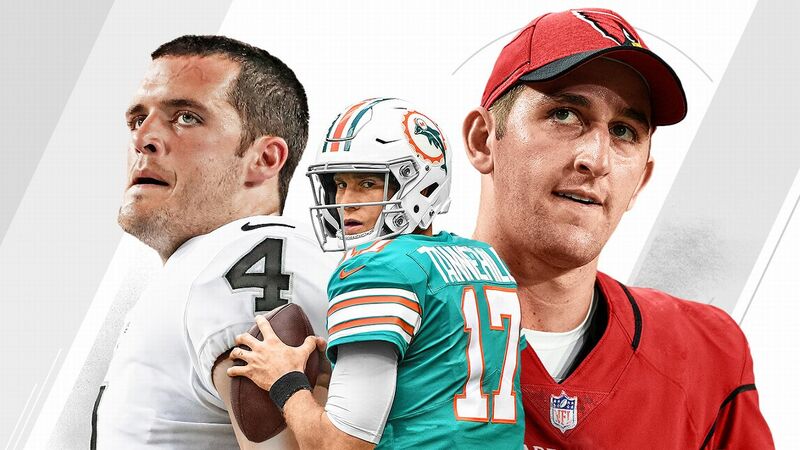 Sure, Carr might have the third-most losses by a QB in his first five NFL seasons (his 46 career defeats are seven behind his brother David and three behind Blake Bortles), but there are some positive things to build upon. Interceptions. Darnold was picked off 15 times, an average of once every 27 attempts. Every rookie throws interceptions, but it was somewhat alarming in Darnold's case because it was a continuation of his final season at USC, when he had 13. Mostly, he sabotaged himself with poor decisions, based on misreading coverages, but there were two or three instances in which he was victimized by a poorly designed play. The Jets, who changed their offensive hierarchy with the hiring of coach Adam Gase, are hoping that no longer will be an issue. He already started. Darnold led the league in Total QBR over the final four weeks (80.9), thanks to no interceptions in the last three games. The key to his turnaround? Instead of forcing a pass under duress, he used his athleticism to get outside the pocket, keeping it himself or throwing on the run. To keep the arrow pointed up in 2019, Darnold must have a better understanding of risk vs. reward. He was the fifth-most aggressive passer last season, according to NFL Next Gen Stats, which bases its ranking on the percentage of tight-window throws. You'd rather have an aggressive quarterback than a Captain Checkdown, but there must be a happy medium. When Darnold finds it, he could be special. Last season was the first time Keenum entered as the unquestioned starter for his team. Keenum seemed uncomfortable at times with the weight of the job in a quarterback-mad region used to winning a lot. He isn't the first to suffer that fate with a team whose current GM -- John Elway -- also happens to be the franchise's greatest player. But the Broncos' injuries on the offensive line -- three starters ended the season on injured reserve -- and an ill-fitting offense that too often tried to protect him in three-wide receiver sets didn't help, either. In the end, Keenum's footwork and fundamentals eroded as the season wore on, and he consistently looked unsettled as he finished tied for the second-most interceptions in the league with 15, including 10 in the first eight games. With the acquisition of Joe Flacco from the Baltimore Ravens, Keenum might be trying to make fixes on another team. But Keenum is at his best in an offense that has a play-action element. Although his history as a college player at Houston was filled with shotgun snaps in open formations, that's not when he has been best as a pro. Too often last season, Keenum tried to escape pressure in the shotgun by retreating rather than climbing in the pocket or by simply getting rid the ball. He often gave up too much ground with no room for recovery. Inconsistency. He was pretty darn good the first month of the 2018 season: 64.7 percent completions, 1,095 yards and seven touchdowns with three interceptions. Then his season deteriorated. He threw for a career-high 430 yards but also committed a career-high five turnovers (four interceptions) in a loss at Kansas City and was benched early in the second half two weeks later after he lost a pair of fumbles. He started the following week before getting benched again Nov. 26 after he was terrible in a loss at Buffalo. Bortles started the regular-season finale but managed only 107 yards and an interception. He'll be getting a fresh start elsewhere, because the Jaguars are expected to release him before the 2019 league year begins, even though that'll cost them $16.5 million in dead money. Bortles' mechanics have always been loose, and he has struggled with turnovers throughout his career: He leads all QBs in interceptions (75) and all players in turnovers (94) from the time he entered the league (third overall pick in 2014). He needs to be in a situation where he's got playmakers around him and a coach with a touch for QBs (such as Bruce Arians in Tampa Bay). Accuracy and consistency. In seven regular-season starts, Jackson completed more than 60 percent of his passes only twice and produced over 200 yards passing once. He was much more comfortable making plays with his legs than his arm. It wasn't that Jackson showed impatience in the pocket. He was just more likely to break a long run than hit a receiver deep. There were times when John Brown was wide open downfield and Jackson didn't come close to hitting him. His biggest problem was driving the ball to the sideline. His 47.8 completion rate outside the numbers was the worst among quarterbacks in 2018. Work -- a lot of it. What no one can doubt is Jackson's commitment to becoming a complete quarterback; he's been described by coaches and teammates as a "gym rat." Jackson is expected to meet with his wide receivers this offseason for private throwing sessions, which should help his rapport with them. Before he took over for the injured Joe Flacco around midseason, Jackson received few reps with the starters and didn't throw much to Brown, Michael Crabtree and Willie Snead. In order to work on his fundamentals, he often spent a half-hour after practices working with quarterbacks coach James Urban. This offseason, Jackson will get a majority of the snaps, which many see as the crucial piece of his development. The Ravens also will look to upgrade at wide receiver. But that should come in the draft (perhaps as early as the first round) because it will be difficult to persuade free-agent wide receivers to play in Baltimore until Jackson proves he has taken the next step. Tannehill's biggest career issue has been an inability to stay healthy, and that popped up again when he missed five games because of a right shoulder capsule injury. His biggest issue in 2018 was that he lacked the pocket presence, mobility and consistent accuracy needed to lead Miami to playoff contention. It might be a function of injuries, but Tannehill held the Dolphins' offense back at times and often collapsed when the talent level started to dissipate. By the end of the season, opposing defenses forced Tannehill into third downs, and he consistently failed to convert. Tannehill needs a fresh start in a place other than Miami, and it seems the Dolphins are prepared to move on. After seven years of being Miami's uncontested starting quarterback, Tannehill needs legit competition to press him. Tannehill can use this offseason to get healthy and work on his feel within the pocket. Tannehill's low QBR shows, at this point in his career, he should be a complement to the offense rather than the focal point. But Tannehill has been and still is a starting-caliber QB who will have an opportunity to bounce back with better health, pass protection and weapons in 2019. Inconsistency. Rosen would start games slowly, throwing passes too high and out of reach, and then calm down by the fourth quarter and look like the first-rounder the Cardinals need him to be. But it was always too little, too late. If he can start playing well earlier in games, he can prove he was worth the 10th overall pick and that he's better than the worst QBR in the NFL. He needs to be smarter. Throughout last season, Rosen repeatedly said he was trying to make the "hero" throw. He simply can't do that in the NFL. If he can cut down his mistakes, especially early in games, he'll keep Arizona in those games longer -- which could lead to more wins. But with any rookie, time and experience is needed to improve. Rosen played as a rookie, whether that was a benefit or a hindrance, giving him the opportunity to see what kinds of defenses NFL teams run. He needs to take that experience, study the tape and learn how to combat the various looks and disguises all while being safer with the ball.